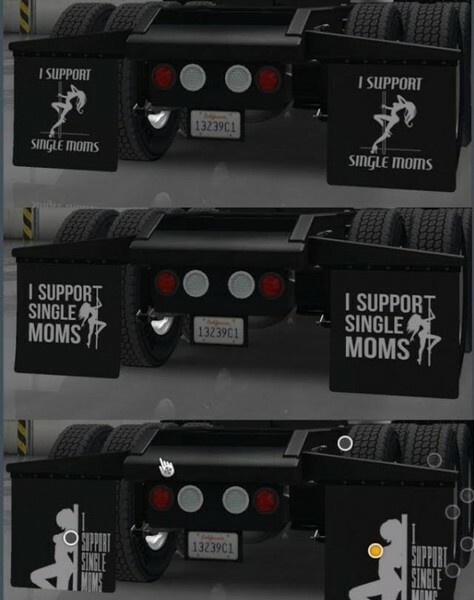 This pack contains various “I Support Single Moms” mud flaps for entertainment purposes which will allow you to customize your truck in a more traditional way. The intentions of this mod are purely to amuse everyone with truck flaps you normally wouldn’t see in the stock game! Additionally this mod will be updated fairly regularly to include more designs and colours to allow for much more customization of your trucks flaps! What’s next for this mod? Add support for SCS official Volvo VNL when (if) released. Remove “Fake 3D” effect from limited edition flaps. It just didn’t look good at all in the end! Oooh Shiney! Add chrome versions of the original 3 flaps to Kenworth W900! Change displayed name of all flaps in-game to make it easier to find the one your looking for. Some minor price and level adjustments to account for new “real” chrome flaps. * Recreate “Destiny” mudflaps to make them look much better. * New Item! Include new flap “Sapphire” for all trucks! * New Item! Include new flap “Dallas” for all trucks! * New Item! Include new flap “Blaze” for all trucks! * New Item! Include new flap “Trixie” for all trucks!